"This is the book of Adam HaRishon given to him by Raziel HaMalach". Kabbalah and segulot. Amsterdam: Moses Mendes Coitinho, . First edition. Many kabbalistic illustrations. This is the first edition, edited and printed based on manuscripts. 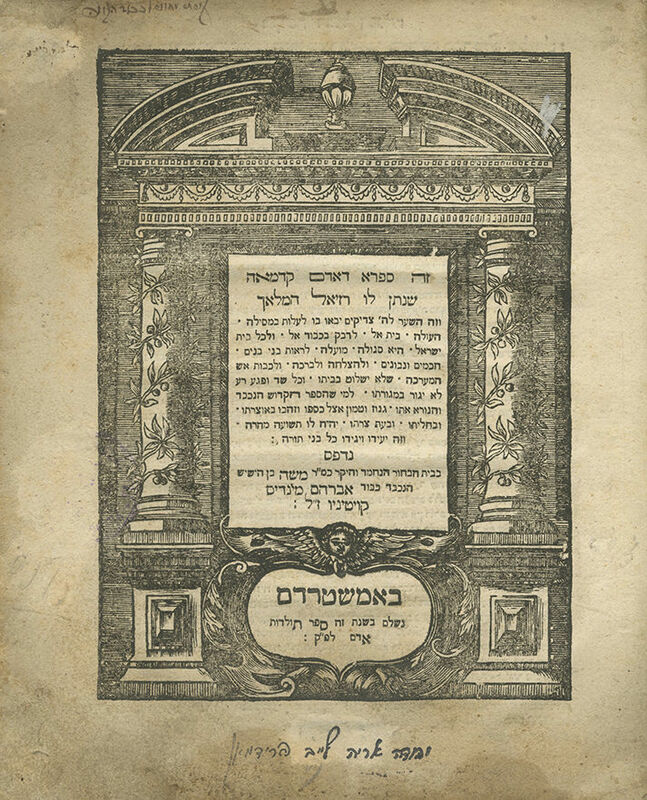 This book is the source of many renowned segulot, for remembering Torah study, a protective amulet for a woman giving birth, etc. Just having this book in the house is a reputed segulah for protection from harm and fire as stated on the title page: "An excellent segulah to bear wise and sage sons, for success, blessing and to extinguish fire, so that it shouldn't affect his home, and no evil being should reside in his home, since the holy, awesome book is concealed with his money in his treasury, and in times of trouble it will afford him speedy salvation. And this, any learned person will attest". Some say that it is a segulah for the childless and for women experiencing difficult labor. Ownership inscription on the title page, partially deleted: "I acquired it with my wealth in honor of my Creator [---?]". 18, , 19-45 leaves. 22.5 cm. Good condition. Stains. Dampstains. Minor marginal damage to title page. Margins of several leaves reinforced with paper. Stamps. New leather binding.